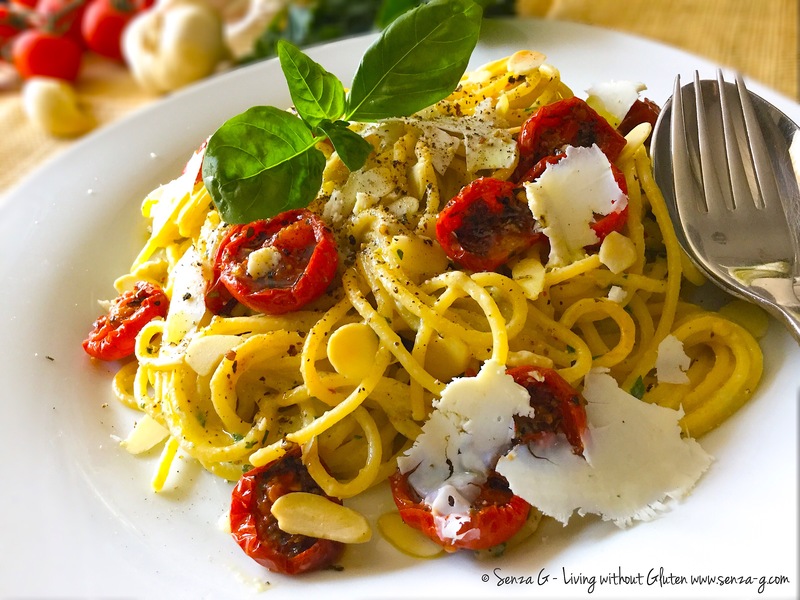 Lovely Mediterranean flavours in this simple pasta dish! You can prepare the pesto beforehand and just refrigerate it. Same with the Tomato confit. Then all you have to do is boil the pasta and combine everything. Cut aubergine in half lengthwise. Score the flesh, place in a baking dish cut side up, drizzle with olive oil and sprinkle with salt and pepper. Place the unpeeled garlic cloves on the same baking dish. Drizzle them as well with a little olive oil. Place in a preheated oven, 220 C, and roast for about 25 to 30 minutes. Leave to cool. When cool, scoop out the flesh and put in a blender. Squeeze out the garlic from their skins and add it also to the aubergine. Pour in a little olive oil and blend. Add the remaining ingredients and again blend until smooth. Bring a large pot of water to boil and boil the pasta until al dente. Drain and put in a large serving bowl, however reserve a little of the cooking water. In a small bowl put a little of the aubergine pesto and add some of the cooking water and mix until smooth. Make it as strong as you like, adding more pesto as you prefer. Sprinkle the top with the flaked almonds and shavings of Ricotta Salata or Parmesan.